This review of Odorex Foot And Shoe Deodoriser is meant to help the customers make an informed decision regarding the product and to also describe the product in order to make it clear what it consists of. 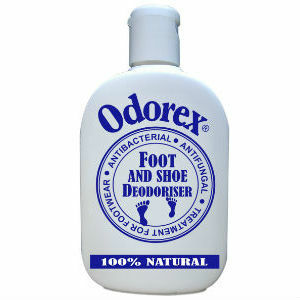 Odorex Foot And Shoe Deodoriser is a uniquely formulated powder that is anti-bacterial, antiperspirant and anti-fungal meant to provide much required relief when it comes to foot odor as well from shoe odor. Regular use prevents the growth of organisms that cause Tinea. It is available on the product’s website and shops for shoe repairs. Moreover, you might hear about it from your podiatrist. Read on to know more about the ingredients that are used in this product as well as to get an overview of this product. One needs to shake the bottle before using it and shake the powder on the problematic area. After that, one needs to distribute the powder evenly in the shoes. You should do this for 7 days in order for the powder to be effective. Regular use of this powder helps prevent the growth of organisms that cause tinea and athlete’s foot. The product is reasonably priced at $9.95 for 60 gms which is the price that is given on the product’s website. There are no other discounts or offers available with the product. There are no guarantees given by the manufacturer of the product and therefore leaves it to the discretion of the customers on whether or not they should buy it. The customer reviews on the website are encouraging ones as a lot of customers have written positive reviews regarding the product and recommend using the product in order to get rid of feet odor problems. Odorex Foot And Shoe Deodoriser contains active ingredients that are effective in getting rid of the odor problem and one treatment is effective enough to keep the odor away for six months. In addition to this, one bottle can treat up to ten pairs of shoes and keep them odor free for up to a year. Being antibacterial, antifungal and antiperspirant; the product aims at treating organisms that can lead to tinea and athlete’s foot. The instructions have been provided clearly and go a long way in helping a customer use the product in the most effective way. However, the downside of this product is the lack of a guarantee by the manufacturer that hasn’t been provided to the customers. Since it is priced low it makes it a viable option to explore. There is no mention of side effects and due to the lack of warnings given for this product, it is advisable to consult a doctor before purchasing it. The bottom line is that the product is good but should be used only after consulting a doctor. Jimmy Rodriguez	reviewed Odorex Foot And Shoe Deodoriser	on November 19th	 and gave it a rating of 3.